You love your bike but as it grows old, the cost of repairs is starting to take its toll on your wallet. Do you need some quick cash? You can now ‘sell motorcycle fast’ just by making a phone call! There are many ways to sell motorcycle models that have grown old, or are too costly to repair. However, it is important to choose the one way that is the most convenient for you. Of course, you can go to the Internet and post Craigslist ads, hoping that someone will call you and you can strike at least a fair deal. This means that you will have to wait by the phone day after day, and you may never get a call. After you get in touch with a possible buyer, now you may think it all comes down to saying “I want to sell my motorcycle”, but it may not be as easy as you believe. The buyer will want to get a lower price, while you will try to convince them otherwise. The bad news is that all this effort may go to waste, if you cannot reach an understanding with them. And then it is back to the ads and waiting for someone to call for your bike. The thing is it takes a bit more to know how to sell a motorcycle. You cannot leave everything to chance, as you may not get a good deal, and you may not be able to sell your bike at all. What you need is a bit of know-how, such as who the best buyers are, where to find them, and how to negotiate a good deal. For such things, companies like ours have been created. When someone wants to sell motorcyclemodels fast and easy, we are here to help. How can we help you sell your motorcycle fast? It is quite simple: you give us a call, we come by to take your bike and, what you may like best, and we will bring you the cash to make the exchange fast and easy. When contacting us, it is enough to say “I intend to sell my motorcycle” and we will give you a great quote in no time. You will see how easy is to learn how to sell a motorcycle, and you will never want to go back to other methods for selling your old bike models. 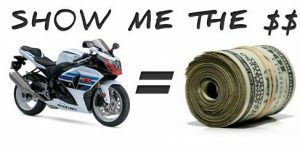 If you want to sell your motorcycle fast to get instant cash, do not settle for less! For all those who say I want to sell my bike fast, TheBikeBuyers gives them a great quote in no time.